Surfactants have several critical functions in the latex polymerization process. Once applied to a substrate in a coating formulation, the surfactant is no longer necessary and is usually undesirable, because it can cause defects, increase moisture sensitivity, and reduce adhesion to the substrate. Reactive surfactants that can deliver the necessary latex monomer stabilization and polymerize into the latex particle provide the benefits of surfactant usage without such negative effects. The E-Sperse® RS-series are APE-free surfactants, which contain a functional group to copolymerize into latexes during synthesis or cure into alkyd coatings. Surfactants that are reacted into the system produce high performing, very water resistant coatings. 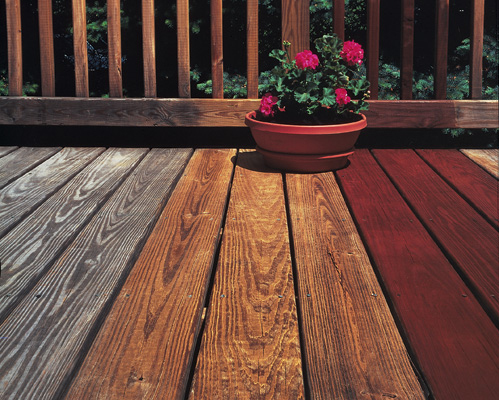 The RS-series of reactive surfactants are especially useful in highly hydrophobic coatings such as deck stains, direct-to-metal paints, primers, and other coatings in which high water resistance and excellent adhesion are desired. The RS-series may be used in conjunction with E-Sperse® 700 series of non-reactive surfactants to minimize reactor fouling and maintain low particle size. Because of the drive to reduce volatile organic compounds (VOC) in paint formulations, the use of propylene glycol and other short chain glycols has been reduced or eliminated. Glycols act both as freeze/thaw stabilizers and coalescing agents. The lower glycol content results in faster drying of the coating, reducing its open time. To improve coalescence, formulators have moved to latex resins with a lower Tg, which are softer and more susceptible to freeze/thaw damage, further compromising the stability of the resin. In order to keep a high performing formulation, glycols must be replaced with one or more surfactants that are VOC-free. Not only does the surfactant add cost relative to the glycol, it potentially introduces a number of problems, such as reduction in surface adhesion, especially to metal, reduced water resistance, thickener efficiency, and often decreased washability. The better solution to preserving freeze/thaw stability and to lengthen open time of low Tg latex-based formulations is to manufacture the latex with E-Sperse® RS-series reactive surfactants. Non-reactive surfactants can dynamically adsorb onto and desorb from the particle surface, therefore, at any given time a certain amount of surfactant will be in the continuous phase and ineffective at preventing ice damage. The RS-series contains functional groups that participate in the latex polymerization, thereby incorporating the surfactant into the latex particle. The reactive surfactants are bound onto the latex particle surface, preventing ice crystal damage and requiring less total surfactant to obtain freeze/thaw stability. Additionally, latex-bound surfactants will not interfere with thickeners in the formulation. A similar effect extends open time. Surfactants bound onto the surface of the latex particles keep the particles separated longer, slowing coalescence, and, therefore, slowing drying. E-Sperse® RS-1617, a nonionic surfactant, gives the largest positive effect on freeze/thaw stability and open time. Combining it with a suitable amount of one of the anionic surfactants, RS-1618 (sulfate) or RS-1684 (phosphate), will give the best combination of desired properties and low particle size. E-Sperse® RS-1618 does provide some freeze/thaw stabilization without addition of a nonionic surfactant. When using E-Sperse® RS-1684 to make a latex, the latex particles readily adhere to certain TiO2 pigment particles to form a composite particle. These composite particles show greater hiding power (opacity) in a formulated paint than the same TiO2 slurry in non-composite form. For more information about this effect, see the American Coatings Show presentation by Dr. Charles Palmer. The RS-series of reactive surfactants bind to the latex particle at the surface where they are needed for micelle formation, therefore, usage rates are generally lower than for non-reactive surfactants. When substituting the reactive surfactants into an existing latex recipe, use the same active charge initially. If the properties of the latex produced are suitable, perform a ladder study to optimize the surfactant loading. E-Sperse® RS-series products can be used as pigment dispersants in either aqueous systems or the ink industry’s solution acrylic systems. E-Sperse® RS-1616 reduces viscosity in pigmented solution acrylic systems as much as 30%. Guide recipes can be provided upon request.